I spent yesterday loading everything back into the Craft Cave and sorting and reorganising it all. I love doing that! It looks so much brighter and more spacious now and I'm not tripping over things every time I turn around. Despite how lovely it is I still felt a bit rusty when I went in there today - I always do after a few days off. I managed to put together a card for a few challenges though. Today is the last day to play along with the Practical Solutions for Paper Crafters challenges at the Moxie Fab World and my card fits into two of the categories: The Don't Throw It Away Challenge and the DIY Embellishments Challenge. 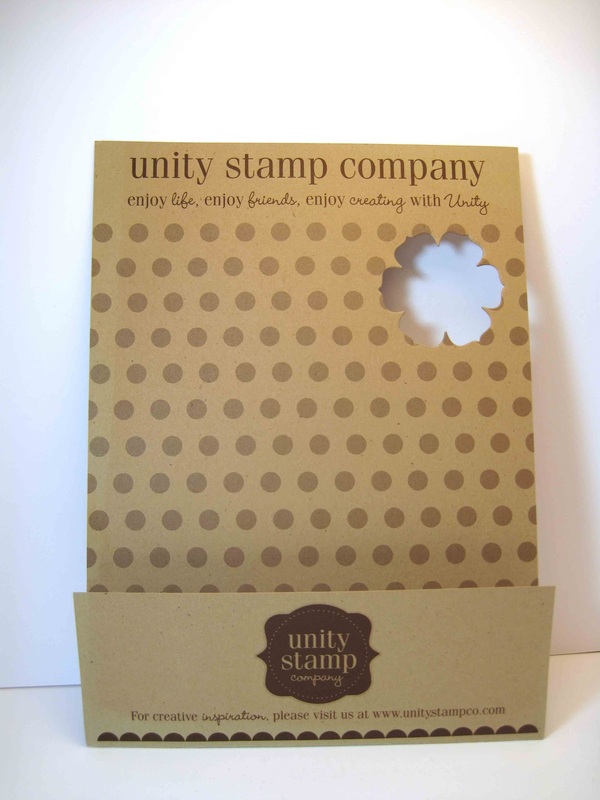 Some of Unity Stamp Company's packaging has these perfect polka dots on kraft card. I die cut one of my flowers from it (Don't Throw It Away) and layered it with a bigger flower, some buttons and twine to make a DIY Embellishment. 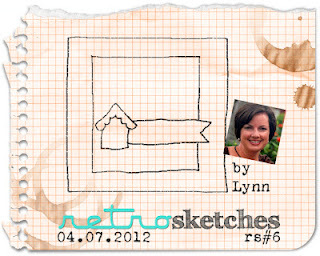 I used Lynn's sketch from Retro Sketches for my design and, since I used two of my favourite tools (my Cuttlebug and heat gun), I'll be entering this over at the Simon Says Stamp Favourite Tool Challenge. Hey there! 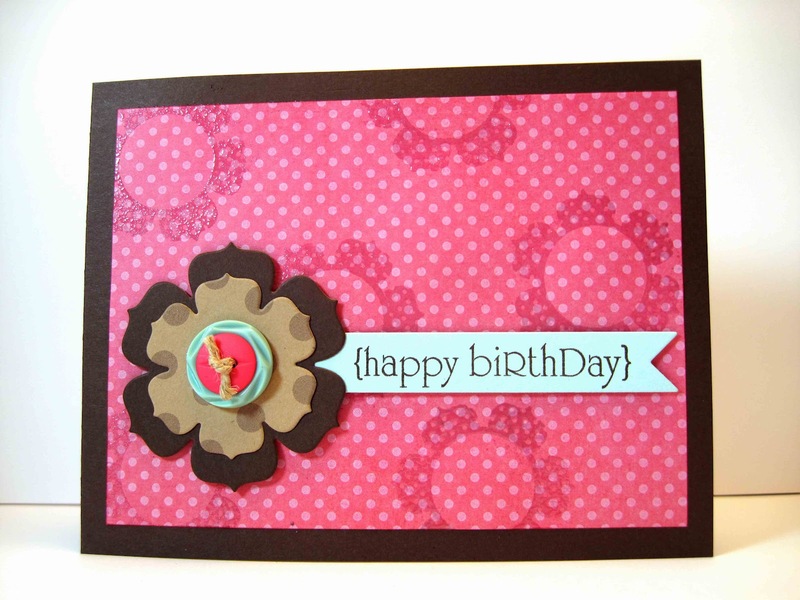 Love the look of clear embossing over the patterned paper! And that is some cute packaging (I probably would have saved that too)! Hope you get some more time in your craft cave this week! Isn't it amazing what a fresh coat of paint and some reorganizing can do? I'm feeling a bit rusty in the craft room myself, but now that we're back to "regularly scheduled programming" I hope I can get back in the groove. yahoo for everything back to normal in the craft cave...love your card and excellent upcycling!!! Great colour combo - love how you echoed the flower on the background! Great card--and so many challenges, too. Good for you. I love that kraft packaging you used. I'd buy that if it were paper. Lovely card Jen, your focal point is so creative. Gorgeous card Jen! How exciting to be 'back home' and a new and improved one too. Can't wait to see what you create now! I super duper love this card. I really like CAS cards. I hope you don't mind, but I might scrap lift this LO. So glad you could play along with Retro Sketches...love your colorful card! And I'm sure your happy to be back in the Craft Cave again...I get grumpy when I'm gone from my room for too long!! This is freakin' brilliant! Love that you used some of your Unity packaging. Great colours and layout! Such a great card with a fun happy vibe to it. Your flower is beautiful. I've got to try the embossing on patterned paper - it looks so cool. And of COURSE you have to use the Unity packaging. You can't throw that kind of stuff away! Seriously cute embellishment, Jen....you should go into business! Ha! 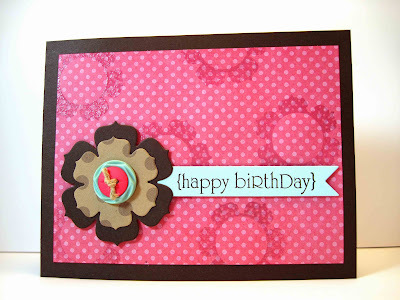 This is a super-cute card with eye-poppin' colors. Love it. Glad you are back in the cave - must feel good. What color did you paint? Thanks for all you do! Jen, you are so clever - LOVE this beautiful card! Thank you so much for playing with us at RetroSketches this week! This is beautiful, Jen! I love how you used the Unity packaging. Also great way to use up packaging! !